The oxydum processed of pure lead. Mainly in Henan, Guangdong and Fujian provinces of China. Without bad smell, metallic acrid taste. 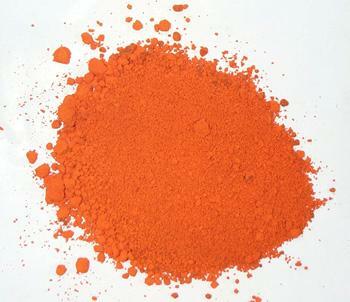 Orange red, delicate, smooth and glossy, without coarse grain and not knotted with water. Pungent, slightly cold; toxic; heart and liver meridians entered. Counteract toxic pathogen and resolve putridity and promote tissue regeneration, astringe dampness and kill parasites and relieve itching. It can counteract toxic pathogen, resolve putridity, promote tissue regeneration and heal wound. It is used singly for initial stage of red swelling of sores and ulcers or pus formed but without ulceration for external application. For unhealing abscess after ulceration and deep-rooted carbuncle, it is often combined with putridity-resolving and wound-healing herbs to obtain the actions of counteracting toxic pathogen and resolving putridity and astringing dampness and healing wound. With the actions of astringing dampness and relieving itching, it is indicated with small dose to treat eczema, impetigo manifested as erosive skin and much excretion and unbearable pruritus. It is often combined with heat-clearing and dampness-drying herbs to obtain the actions of clearing heat and relieving toxicity, and drying dampness and relieving itching. For instance, it is combined with Huang Lian and Ku Fan, etc. It can kill parasites and relieve itching, so it is indicated for scabies and stubborn ringworm, often combined with Liu Huang to reinforce the action of killing parasites. It is also used as material for preparing of plaster and often combined with plant oil and relative toxicity-relieving, blood-activating and tissue-regeneration-promoting herbs to make into plaster for diseases in department of surgery, internal and traumatology. Take proper dose for external application. Take in powder directly or made into plaster for external application. Take 0.3~0.6 g in powder or pills for internal application. It is toxic so it should not be used overdose or for a long time to prevent cumulative toxication.